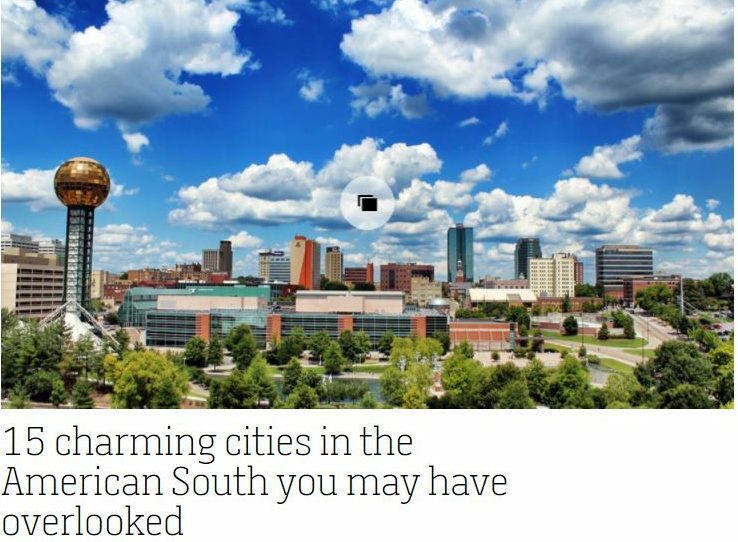 (CNN) — There’s more to America’s Southern states than cities such as Nashville, Austin and New Orleans. In fact, in recent years, so-called “second-tier” cities in the South have witnessed a massive boom in hotels, restaurants and micro-everythings. Travel companies agree, too. “With the appeal of an all-American road trip style of travel, famous barbecue cuisine and a rich musical heritage, we’ve seen international bookings to Southern US destinations double in the last year,” says Intrepid Travel’s Director of North America Leigh Barnes. Their “Southern Comfort USA,” trip — which weaves travelers through Savannah, Georgia; Asheville, North Carolina; the Blue Ridge Mountains and beyond — has experienced a whopping 180% growth. With diverse picks ranging from San Antonio and its old Western feel to post-industrial Birmingham, Alabama, here are our 15 favorite Southern cities flying under the radar. A flight of stairs below street level, SA’s River Walk offers plenty of opportunities for dining and nightlife. Grab a stool at Ocho, where you’ll get a bird’s eye view of the water, and wash down an order of the huitlacoche quesadillas with a Havana margarita. The St. Anthony feels haunted in the best way possible. After you’ve gotten the perfunctory shot with the hotel lobby’s grand piano (Billy Joel recently test drove its keys), head to the new Sky Terrace, a hip rooftop scene with live music on Saturdays. A vibrant city perched on the San Antonio river, the bustling River Walk melds European charm with Tex-Mex flair. In addition to the eateries, there’s shopping, museums and river taxi tours. Sure, there’s the Alamo, the historic battlegrounds for the famed fights during the Texas Revolution in 1836. But San Antonio has a lot more going for it. Venture to the Southtown Arts District, on downtown’s southern tip, or scope out The Pearl for its brewery, events, weekly farmers market and more. You won’t go hungry in The Magic City. Eat too much swordfish and blistered okra at Hot & Hot Fish Club; drink too many icy cold brews at revered local haunt The Garage Cafe. There’s a new food court. Pizitz Food Hall is housed in a former downtown department store, but until crowds fade out, we’d choose Carrigan’s Public House on the outskirts of downtown. There, savor fine bites and killer martinis on their comfortable roof deck. Barbecue is its own food group here. Carlile’s BBQ has the best potato salad in town, while Dreamland Bar-B-Que churns out melt-in-your-mouth ribs. Sleep it all off at the newly restored Redmont Hotel, with an ambiance that still tips its hat to the roaring ’20s. Meanwhile, the Westin Birmingham has a Todd English restaurant, outdoor pool and free airport shuttle. Gaze at 56-foot Vulcan, the world’s largest cast iron statue, designed by Italian artist Giuseppe Moretti in 1904. It’s located inside Red Mountain Park, which contains two city overlooks, three treehouses, a giant dog park and zip lining. On a more serious note, there’s plenty to see at the Birmingham Civil Rights Institute and the Alabama Jazz Hall of Fame. First, visit Hudson’s Hill to choose from heritage denim and handmade gifts. Then, catch a show at Triad Stage‘s Pyrle Theater or The Barn Dinner Theater, which has been operating since 1964. Norfolk is home to a surprisingly dynamic vegan scene (our guess is it has something to do with animal rights group PETA being headquartered here). And even if you’re not into plant-based eating, do yourself a favor and try the vegan breakfast burrito at Yorgo’s Bageldashery. At night, book it to A.W. Shucks, a raw bar hangout for locals, or enjoy a formal experience at Todd Jurich’s Bistro that has all the perks of an upscale restaurant (stellar service, interesting menu, fun people watching) with none of the pretension. Shopping fiend? The new Simon outlets open this summer. There’s also the colossal MacArthur Center. If you’re in the market for new ink, book it to the NEON District for Fuzion Ink Tattoo and Piercing Studio, followed by an improv show at Push Comedy Theater. Go upscale with modern Southern fare at Knox Mason or spear your fork into hybrid dishes at Bistro by the Tracks where the duck ramen is as inspired as the traditional butcher’s crock pie. Our pick for the South’s most important dish? Sweet P’s BBQ and Soul House, where a rack of ribs and pint of ‘tater salad is about three racks and seven pints too few. Any vacation that starts off with an old fashioned smoked right before your eyes is likely a good one. At the newly opened TENNESSEAN Hotel’s restaurant, The Drawing Room, sling back one or two of the aforementioned elixir before wandering around Knoxville’s highly walkable downtown hub. Treat yourself to a meal at Red Barn Kitchen, where there’s a whole hog barbecue roast on the last Thursday of every month. With a moonshine cocktail en tote, beeline to the upbeat patio, which often hosts local musicians. The Kentucky State Fair runs August 17-28 with live music, cooking competitions and one of the world’s most acclaimed horse shows. America’s largest indoor fair also boasts The Great American Spam Championship, if canned meat is your thing. To try more things, frolick around town with food-centric Mint Julep Tours where the Chicken Fried, Gettin’ Pickled and Butter My Biscuit tours will all ensure you’re not hungry for the next nine years. If you favor staying in one spot, sip on a boozy milkshake and enjoy grub like a grilled cheese that (almost) rivals dad’s at Red Herring Cocktail Lounge & Kitchen. If the wide open road calls, tack on a quick road trip (about an hour and a half) to Shaker Village — where you can take in 34 original Shaker structures in the country’s largest private collection of original buildings from the 1800s — and spend the night at The Inn. There’s way more to Lou-ah-vull than bourbon, horses and fancy hats. For instance, geek out at “Hunger Games: The Exhibition” as you explore the wild world of Panem at Frazier History Museum (through September 10). And then, of course, there’s the bourbon, horses and fancy hats. Running into all three is pretty unavoidable here. Be sure to carve out time for a drink at Lola, the fabled upstairs bar of Butchertown Grocery. It’s got a speakeasy vibe, and one hell of a drinks list. Plan your stay at The Townsman, C’ville’s newest boutique property arrival with four carefully appointed rooms in the downtown hub. If you’re looking for something a little more isolated, treat yourself to a stay at Keswick Hall at the foot of the Blue Ridge Mountains. The 48-room manor’s gold medal goes to its prestigious golf club, though we gravitate toward the grounds’ three pools. There are two types of people who come to Charlottesville: Dave Matthews Band superfans and everyone else. If you’re in the former group, you’re likely making your pilgrimage to Miller’s, where Matthews himself once tended bar, to Matthews’ own scenic Blenheim Vineyards and to the Pink Warehouse where the band played its first official gig. If you’re everyone else, swap Dave stalking for visiting a presidential home like Thomas Jefferson’s estate, Monticello, or Highland, the former digs of James Monroe. Music lovers, head to Lucy Buffett’s (yes, sister of a certain Jimmy) LuLu’s for an energetic vibe and serious seafood platters. Or, complete your Bushwacker (an ice cream-based cocktail that’s as popular as a vodka-soda here) crawl at Flora-Bama, a dive bar, multistage music venue, oyster bar, Sunday church and occasional rodeo rolled into one beachside locale. Finish up with a boozy cake from Rum Sisters or play mad scientist at newly opened The Yard Milkshake Bar, and create a custom dessert. Who said a glazed doughnut or brownie isn’t a suitable milkshake topping? Gulf State Park also offers lakefront cottages and around 500 RV sites and a tent camping area (many have swimming pools and other amenities). Newly launched Gulf Shores Travel Trailer Rentals will allow you to reserve a spot at any of the local campsites, and then drop off an RV for you and pick it up when your vacation ends. Make as few plans as possible — you deserve it. Plop yourself on the sugar-white beaches (which rival any Caribbean treasure) with a stack of magazines or a book. If you’re so inclined, a beachside slow-flow class with Glow Yoga is a relaxing delight. It’s hard to have a bad night at the open-air Wharf Amphitheater (acts this summer include Kenny Chesney, Green Day and Eric Church), where in true vacation mindset, your best bet is probably walking up to the box office 20 minutes before the main act takes the stage — the $20ish bleacher seats are surprisingly stellar. Seafood is king here, though you can find plenty of menus graced with Southern staples like butter beans and pimento cheese, if you’re seeking more down-home cookery. The Graystone Inn, built in 1905 by a railroad magnate’s widow, proves a nice place to count sheep and a spot you may also recognize from “Dawson’s Creek,” “One Tree Hill” and “Sleepy Hollow,” among others. To fulfill your veranda rocking chair fantasies, check into The Wilmingtonian, on a quiet street dripping in tree-lined perfection that’s only a short walk to the Cape Fear riverfront, a scenic strip studded with watering holes, eateries and specialty stores. Don’t skip town without paying a visit to Airlie Gardens, an alternate 67-acre universe with live oak trees (it gets its name from the 472-year-old Airlie Oak), a freshwater lake and winding paths of seasonal blossoms. Start at Triplett-Day Drug Co., a family-owned soda fountain that will teleport you to the “Leave it to Beaver” glory days. Rest your head at The Guest House at Gulfport Landing, an endearing bed and breakfast that dates to 1906 (it was restored in 2014, so you won’t need to worry about unplugging). Grab a ferry to one of the area’s barrier islands for a half-day excursion with Ship Island Excursions (full-day trips are also available), where you’ll be spoiled with views of Fort Massachusetts, which was built in 1866, and idyllic beaches free from mainland crowds. Also, it’s worth considering a wintertime trip, as holiday enthusiasts will rejoice in the spectacular Gulfport Harbor Lights Winter Festival, which runs from the end of November through the start of January. Last year it drew 60,000+ guests, not only for the dazzling illuminated displays, but also for the food trucks, rides, live performances and the 40 acres of greenspace it takes up on the majestic Gulf of Mexico. A city steeped deeply in Moravian roots (they’re a Protestant denomination with German and Czech heritage), you’ll note this the most in the Old Salem Historic District and on your taste buds; expect Moravian chicken pie, sugar cake and thin cookies (try the ginger ones). Local brewery Foothills Brewing even creates a Moravian Porter every holiday season. A glass of wine is always in easy reach here, too. Gaining traction as the gateway to the Yadkin Valley wine region, the state’s first and largest American Viticultural Area established in 2003 and now booming with 45+ wineries. Or, take a tour and tasting of whiskey at Broad Branch Distillery. Another solid bet is Sutler’s Spirit Co. where you’ll swear their handcrafted gin is the nectar of gods. The first Kimpton-brand hotel in the Carolinas, Winston-Salem recently got The Cardinal Hotel, inside the historic R.J. Reynolds building. Between the adult recreation room (oddball feature: an adult-sized twisting slide), indoor basketball court and bowling alley, you won’t get bored here. Don’t miss a meal at the ground floor’s Katharine Brasserie, named after the Reynolds’ family matriarch. Get a sense of Fayetteville’s local pride at seasonal First Thursday fêtes, May through October. Then, ride that happy buzz along the Fayetteville Ale Trail, a self-guided journey where you can fill in your beer passport with all the breweries in Northwest Arkansas. Want to skip the trail? Try Columbus House Brewery, that hosts a running and cycling club and welcomes dogs with open arms. Alternatively, there’s Fossil Cove Brewing Co., which attracts an Ultimate Frisbee crowd and provides a ton of crave-worthy food trucks out back. Or try Maxine’s Tap Room, a combination revived hipster pub and community music hub. Locals flock to Hugo’s , a mainstay since 1977, where the deep-fried potato skins are worth every calorie. For lighter fare, try Greenhouse Grille and marvel at how the hell they made Brussels sprouts taste so good (hint: frying them with pickled peppers and apple vinaigrette helps). Recently, Fayetteville has been making headlines for the mountain biking trails throughout the region. And cyclists will be delighted to hit the Razorback Regional Greenway, a 36-mile trail that connects six cities in the area, with plenty of attention-grabbing vistas. But if pedaling isn’t for you, get a dose of nature with an hour drive to Kings River Falls for a hike and pristine watering hole views. History buffs will appreciate a visit to The Clinton House Museum, the former first couple’s first home together stacked with memorabilia and a beautiful garden (they were married in the living room). Perched on a 27-mile strip of sugar-white sand beach where the Gulf of Mexico and St. Andrew Bay come together, you’ll find more old-school Southern charm here than Miami-style glitz. We love the quiet west end of the beach and the spacious, airy Carillon Beach Rentals that also boasts five private pools, restaurants and a spa within a private community. Put the smartphone down and feast your eyes on the natural wonders at St. Andrews State Park — if time allows, tack on snorkeling or kayaking — especially the two nature trails that weave you through a smattering of coastal plant species. Down by the bayou, it’s difficult to meet a meal you don’t like. You’re dining in the Crawfish Capital of the World, in which the yearly Crawfish Festival in May draws hundreds of thousands of hungry and thirsty visitors. Revel in the liquor-soaked Zydeco brunches at Buck & Johnny’s, then enjoy a flawlessly prepared gumbo at Chez Jacqueline. You’re in Cajun country, so while the service may be slow, the homespun food will be well worth the growling stomach while you wait. Meanwhile, nearby Lake Martin has made the Audubon Society’s list of top 10 bird watching spots in the United States. Say cheers at The Dark Corner Distillery, a craft microdistillery with moonshine as good as your brother-in-law’s. The Swamp Rabbit Inn is a refreshingly chic bed and breakfast that’s two blocks from its namesake Swamp Rabbit Trail, an 18-mile bike trail. Or, reserve your room at Aloft Greenville Downtown, close to downtown’s shops and restaurants. Perri Ormont Blumberg is New York City-born and -based writer. She’s a graduate of Columbia University and the Natural Gourmet Institute culinary school. Follow her on Twitter @66PerriStreet.